Sorry for the not so great photo - I tend to create late at night - not prime photography lighting at all! To make fairy crowns - you can use heavy gauge wire (I have done that several times in the past, and it will work) but if you want a short cut - use the little crowns they sell in the bridal section at H*bby Lobby! I used the cheapest ribbon I could find, at about 50 cents a roll, and a hot glue gun. I wrapped the crowns with ribbon in colors appropriate for each fairy. Then, deconstruct inexpensive silk flowers to create flowery wreaths! The birthday girls crowns are a bit more elaborate than the rest, for them I used pre made garlands I had from previous decorations. 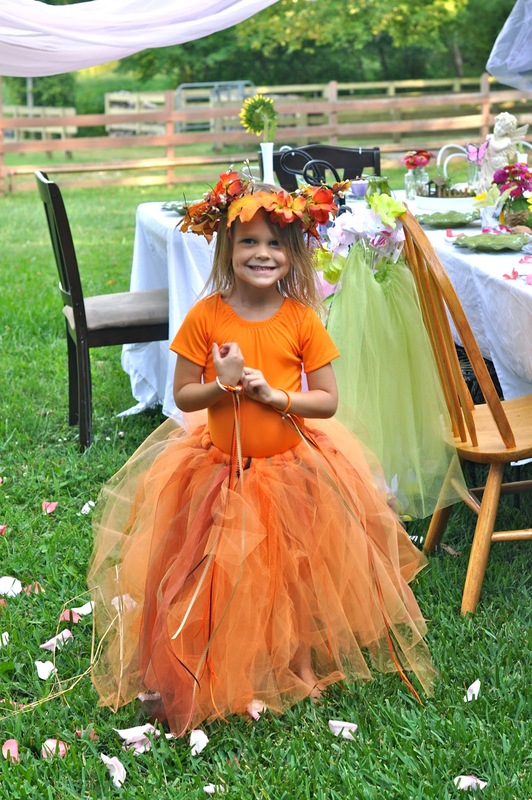 As I mentioned before, Dimples insisted on orange for her fairy garments, so she became our fall fairy. Here are the beginnings of her crown. And here it is completed. The Queen's crown was the same one she had from a previous fairy party, though we did add a few extra butterflies and flowers to freshen it up a bit. I think one of my favorites has to be the Poppy Fairy's crown, but since my favorite color is red, I suppose I am a bit biased! 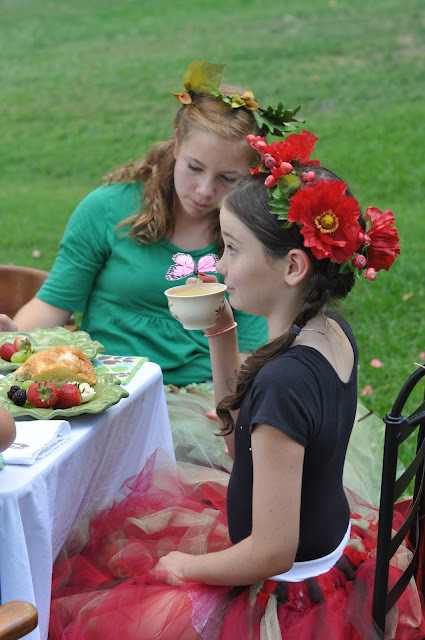 And here is a look at our Hydrangea Fairy crowned. Hot glue gun, cheap silk flowers and voila, a lovely headdress for every fairy. And if you want to minimize cost on flowers, in the past I have ordered a pack of really cheap leis from orient*l trading and deconstructed them to create flower fairy crowns. very fun! love the pictures!